An editor of Photofocus mentioned to me that many photographers have trouble monetizing their photography, especially when working on personal projects and asked that I share a few success stories. I did some research and found that this was the way I have built my business over the years. Here’s one of the stories on how I accomplished this. My personal projects are centered around learning a skill I was am trying to acquire. I then leveraging the image I’d created by selling, promoting the new skill — entering in image competition or garnering press. I hope you find these ideas helpful. Was on a visit to Atlanta to visit with my friends Ashley and Liz. In their neighborhood was a favorite restaurant of theirs called Manchester Arms. It was an overcast drizzly, dreary day. 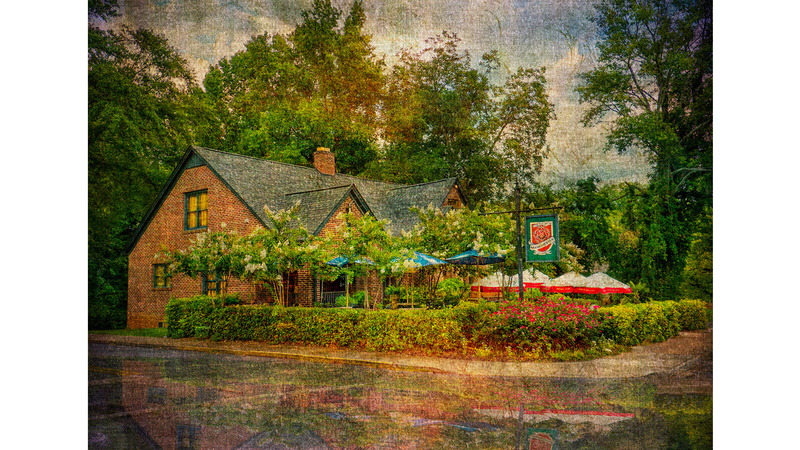 As I was entering the restaurant I noticed it had a kind of European pub flavor and I thought it would make a good subject for a new art technique I wanted to master. Despite the drizzle, I ran outside to grab a few frames from a couple different angles. For this particular use, the soft, overcast lighting worked well. Dinner was just dandy, by the way! Upon my return to Sedona, AZ, and my studio I fired up the computer and started my experimentation. The goal was to create a painterly version of the scene from the original capture using various texture Layers, Blend Modes, Masks and Selective Colors. I began by cleaning up the original and dropping in some detail into the sky. The final version leads off this article. And no, this is not a how-I-did-it article. That’s not the point. It’s about having the right thinking about making photographs that matter. B — not following up on the concept after making the capture. I also might have stopped right there having learned some things about creating this type of look feeling that it was already a success in perfecting a new skill. Starting about ten years ago and to this day, I always look to see how I might obtain money, recognition, images for my portfolio, news releases and new clients from projects including this one. Before leaving the restaurant I gathered contact information of the manager. It always pays to find the correct person to query. This might be the manager or owner or possibly even one of the employees you chatted up about the project while there. I sent an email with a watermarked version of the finished art then I planted the seeds that they might wish to use the image in their marketing material — website, collateral material, T-shirts, etc … A return email had the largest type I had ever seen with the letters OMG!!! And, the request to call ASAP. The resulting call led to selling a canvas art print for display in the restaurant and licensing the use of the image for advertising and marketing. As an aside I had made some images of the walls of the restaurant so I could show the finished art piece in place at the correct size using Pro-Select software. Oh, and as a bonus, the next time I was in town I had a really nice dinner on the house for my friends and me. All of my projects are not greeted with such excitement on the part of a business. But more often than not personal projects have led to sales or marketing exposure in one way or another.